One test stands between you and a place at the medical school of your dreams: the UKCAT. Unlike any other exam candidates have faced before, the UK Clinical Aptitude Test is incredibly challenging, but this print and online resource will help build your confidence and make sure you achieve a high school. 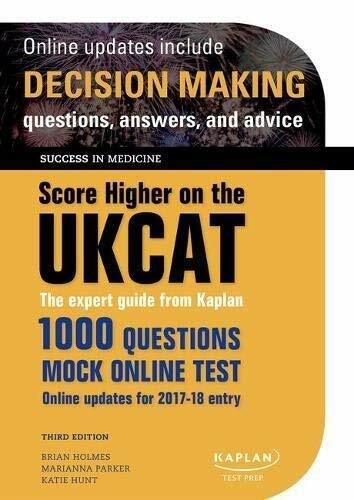 One test stands between you and a place at the medical school of your dreams: the UKCAT. Unlike any other exam candidates have faced before, the UK Clinical Aptitude Test is incredibly challenging, but this print and online resource will help build your confidence and make sure you achieve a high school. Online updates We know that it's crucial that you go into your UKCAT exam equipped with the most up-to-date information available. That's why we've included access to the Oxford University Press Online Resource Centre with this book. It contains a full chapter and example questions for the new Decision Making section of the exam, with further practice questions available on our mock online test. Additional updates and advice from the authors are also uploaded onto the Online Resource Centre to ensure that there are no surprises waiting for you on Test Day. Over 1000 questions and a mock online test Practice makes perfect, and Score Higher on the UKCAT makes sure you get plenty of it! Through the book and the Online Resource Centre you will have over 1000 questions to try, with an online mock test that mirrors the format of the real UKCAT exam available for you to take at the end to give you the best possible preparation. Expert advice from the Kaplan Test Prep team The authors have helped thousands of students prepare for the exam, and study the test every year. They offer invaluable tips on how to approach the questions correctly and strategies to manage your time in the exam, helping you to avoid the common pitfalls that trip up other UKCAT students. With over 1000 questions, a mock online test, and online updates to track any changes to the format of the exam, Score Higher on the UKCAT is the ultimate resource for any student taking the UKCAT.